As part of London Craft Week, join the Dovecot & The Clothworkers’ Company present the Ofili Tapestry at Clothworkers’ Hall on 11 May, for a fascinating insight into the making of The Caged Bird’s Song. The epic tapestry triptych, which was woven over a three-year period at Dovecot in Edinburgh, was interpreted from a watercolour painting by the Turner Prize winner Chris Ofili and commissioned by the The Clothworkers’ Company. The tapestry was the centrepiece to a major exhibition at The National Gallery in 2017, titled Weaving Magic and now hangs in the impressive surroundings of the Clothworkers’ Livery Hall. Hear first-hand how Dovecot Tapestry Studio approached weaving a textile masterpiece to Chris Ofili’s design. Discover how the collaboration evolved, the symbols and meaning behind the imagery in the work as well as how the weavers achieved the tapestry’s extraordinary richness of texture and lustrous colour. Also, there is an opportunity to attend Dovecot Tapestry Studio Weaving Masterclass at Clothworkers’ Hall itself, alongside the tapestry The Caged Bird’s Song. 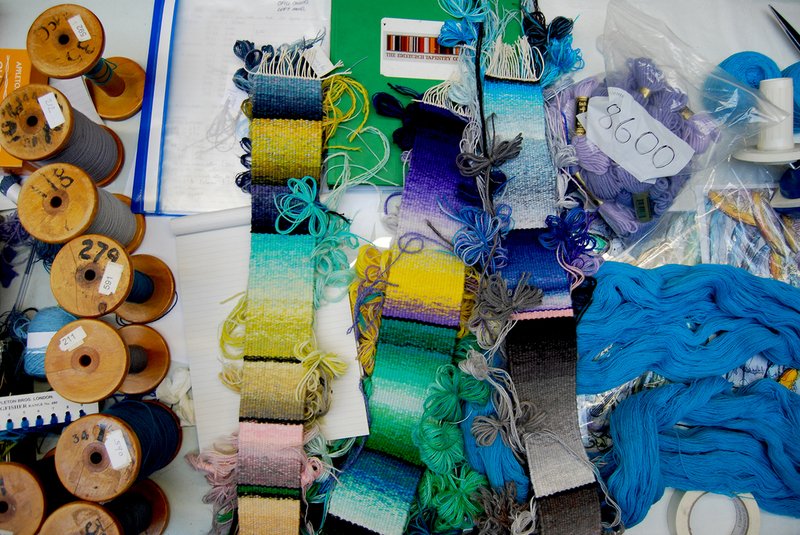 This is an opportunity to discover the creative process of weaving a tapestry, as Dovecot’s Master Weavers describe the process and skills required to translate Chris Ofili’s watercolour pigment into woven wool. The session will include a weaving demonstration and opportunity to try some weaving yourself on a sample loom. Book your place for the talk here and masterclass here.